The website hosts translated primary sources sorted by period, each of which is furnished with a brief introduction and information about the edition from which it is taken. 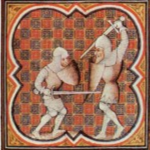 Also included are secondary sources contributed by scholars of medieval military history, including book introductions, articles, and MA and PhD theses, many of which are downloadable in .pdf format; book reviews on recent military history titles; and syllabi for university-level courses on medieval military history. Primary sources by many medieval creators including Orderic Vitalis, Robert of Clari, ibn-al-Athir, Dino Compagni, and others.